Home » toronto zoo elephants » The Show Must go on! Now, if the air quality conditions were as you claim Ed, peachy keen, when the fires were very close and basically raging between Sept 10 to September 14, enough so that you could send the elephants out in to it for photo ops why not have the webcams running? If the animals were calm and unaffected by the fires and smoke then why not have the cams on? Just answer the question Ed, it is not that hard. We are prepared for your answer, “oh there is a problem with the live feed or it’s broken” and if that is the case then why the big deal? Why not just answer the damn question? It appears to be one of the most popular questions on your Facebook page currently, one that goes unanswered by you and your marketing team. But let’s move on to the greater more interesting question that has gone unanswered. Why did you refuse to evacuate and then refuse the help offered to get your entire collection of animals out of the fiery and smokey conditions? We understand why you refused help from the zoological and performing animal experts, accepting this aid from people who use an elephant guide would undermine your lobby efforts to ban the guide. Your fans may not accept this very rational and obvious assessment but there are many people out there who do. Are you incapable of moving those elephants without a major undertaking because simply put your management and training skills are not as world class as you claim? 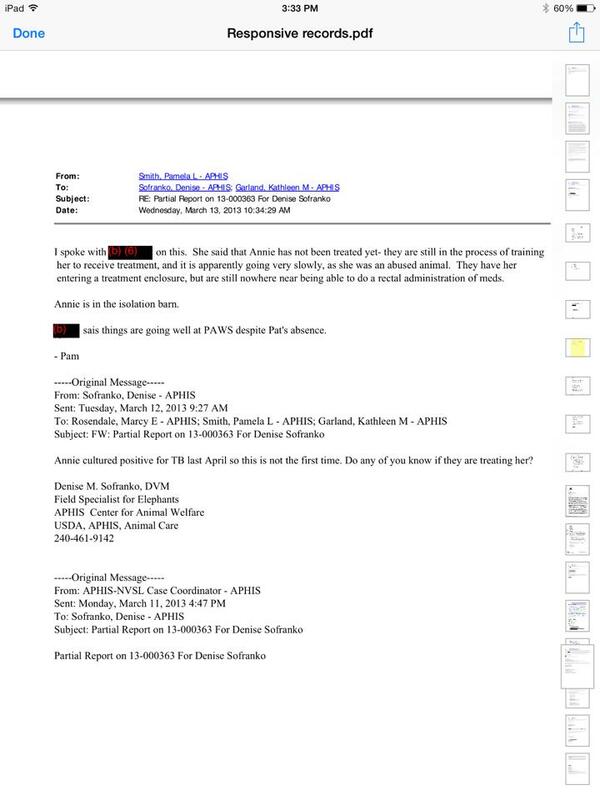 Unable to properly train Annie for treatment of TB would be one indicator this is the case (according to USDA FOI) And FYI Annie was not abused at her zoo, she lived with you for 19 years and you were unable to do anything to heal this alleged abuse or her foot issues? You do remember she was exposed to tuberculosis when you failed to diagnose Rebecca, she had positive STATPAK results shortly after and was eventually diagnosed with active tuberculosis. Your constant misrepresentation of the truth to make excuses for yourselves really is sickening. a year after being diagnosed with tuberculosis she had still not been treated, why? 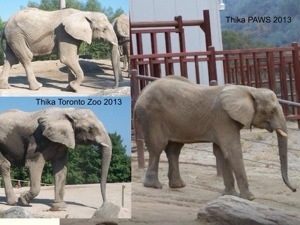 Incapable of integrating Thika with her own family herd or any of the Toronto elephants with your existing herd would be another major red flag. While zoos all over the world are integrating elephant groups within months and even days its been two years and still you cannot integrate our elephants with yours. It is pretty sad to think of Thika living alone all those months and now Toka as well. It seems however that the real reason evacuation was avoided was right there in front of our faces all this time. • Arrival in San Andreas, California, on Friday. • Spend Friday and Saturday nights at a lovely bed & breakfast in this historic Gold Rush town. • Awake each morning to a scrumptious, homemade breakfast. Nicholas, Gypsy, Lulu, Prince, Toka, Thika and Maggie at ARK 2000. • You’ll receive an “insider’s” tour of the elephant habitat and spend the day with PAWS president, and co-founder, Ed Stewart, and ARK 2000 Sanctuary manager, and senior elephant keeper, Brian Busta. • A vegetarian picnic lunch will be served. • On your own for dinner Friday and Saturday. • SUNDAY features a special extended visit with the lions, tigers, leopard and bears in their ARK 2000 habitats. Receive an “insider’s” tour of the habitats. • Arrival in San Andreas, California, by 9 a.m.
• Take part in an educational, fun-filled, day visit with PAWS’ elephants — Mara, Nicholas, Gypsy, Lulu, Prince, Toka, Thika and Maggie at ARK 2000. You’ll explore elephant habitat and spend the day with the PAWS president, and co-founder, Ed Stewart, and ARK 2000 sanctuary manager, and senior elephant keeper, Brian Busta. A vegetarian picnic lunch will be served. This event would have most certainly had to be cancelled if you moved your animals to safety. And with many people likely flying in for the event and with bookings at your friend’s B and B as well, evacuation and rescheduling would have been a financial and logistical disaster for all involved. It was just easier and more financially beneficial to “shelter in place”. How much does this event bring in? $15,000, $25,000? Not to mention all the priceless photo ops you use afterwards to promote yourself. We know there are many of you out there that will be outraged at this suggestion on our part, but we are not concerned about your outrage over us, we could care less actually. Our main concern is the animals and their health and well-being. Anyone who would see this connection and not have an “aha” moment, actually stop and think to themselves that this makes sense is not someone we are appealing to. We are appealing to those who have a rational thought process and who care more about animal welfare than their ideological membership in the PAWS club. Did they refuse evacuation so as to ensure this event was not interrupted or cancelled? You should all ask yourselves this question honestly and without bias. Did you know that USDA elephant inspector Dr. Denise Sofranko has been known to frequent these visitor events? That is relevant when you consider PAWS told a news station that they have kept their inspector informed about their “shelter in place” emergency plan. If a zoo or a private owner had done this there would be a 50 thousand person petition and complaints to the USDA. But PAWS always gets a pass and its starting to appear suspicious don’t you think? One minute Ed Stewart is telling the media “you cannot prepare for a monster fire like this” and the next minute he is saying “we prepare all year for this”. One minute he says they cannot evacuate and the next he says oh we have an evacuation plan. Either you do or you don’t Ed. Just pick one answer and go with it, people ARE PAYING ATTENTION. Should PAWS get a pass just because you support their ideology? Should they get a pass even if it might put the animals’ lives at risk? What happens when the next fire comes from the south or the west and there is no city or highway to buffer the onslaught? The intensity of the heat and smoke alone sweeping across those dry, barren fields would be enough to kill animals. And these fires are not going away anytime soon. Perhaps this will help you decide. When PAWS, Zoocheck and Active Environments moved the Toronto elephants in trucks and with drivers who had little to no experience transporting large animals Thika’s truck’s brakes burned out in the Donner Pass, why we cannot say for certain but it is suggested that speed was a factor. You see it was getting late and dark and good Old Bob Barker and the press were waiting at the facility for the animals to arrive so they could film the big victory. The push days previous to get on the road at a very specific time was probably because they had hoped to arrive on the Saturday of the Grape Stomp event. Imagine how grand that would have been and imagine people opening up their wallets on the spot. They wholly underestimated the time it would take to move these elephants citing originally 40 to 50 hours when in fact it took 85 hours. After Thika’s truck broke down the others chose to speed off with Toka and Iringa leaving Thika behind. Emotionally and physically exhausted and drained she had to watch her only family drive away and leave her behind and alone. Imagine how traumatizing that must have been for her. She was traumatized because she didn’t even want to leave her crate later and it took the Toronto Keepers over an hour to get her to do so and then she refused to enter the barn. And she was allowed to remain outside despite the cooler evening temperatures and not taking into consideration how those cold temperatures could affect an animal experiencing physical or emotional trauma after transport. And as we know the next morning Bob Barker kicked those keepers out after mocking their sadness and tears of course, PAWS did not allow them to stay and aid in the transition as per industry standards. Because it was not about the animals’ well-being it was about egos and pay back on the part of Ed and his team. This is what Thika looked like just days after arrival and we assure you she did not look like that before she left Toronto. But the show must go on. And it really is a show. Carefully chosen video clips and photo ops, limited information, media statements. Everything calculated to present PAWS in just the right way to promote themselves and their profitable animal rights agendas. PAWS continues to have the nerve to accuse people who make their living with animals of exploiting them for money, profit and greed despite several million dollars in profits sitting in their own bank accounts. And to add insult to injury they had the nerve to capitalize on this disastrous and deadly fire to ask for donations for their magical firefighting goat fund. It was only after they were mocked on social media for putting out the begging bowl for themselves that they suggested people assist animal rescue efforts in the areas affected by the fires. Which of course was followed by photos of Ed donating some hay. By the way, with a tuberculosis quarantine order in place for Gypsy and possibly the bulls we were wondering if that hay came from ARK2000, because, well that would be against USDA regulations right? If you want to believe that PAWS didn’t put all of their animals at risk in order to salvage their visitor weekend and a $15+ profit then that is your choice, we believe they did and that is our right. More and more of you have begun to ask questions and we applaud your courage to face the wrath of the super fandom, to stand on your own, step away from the groupthink mentality and do what is truly best for these animals. Keep asking questions and never stop. Hold them to the same standards they publicly demand of others. Those animals depend on your courage. By zoosmatter in toronto zoo elephants on September 16, 2015 .